If you're going to buy an expensive piece of sports memorabilia, one of the most unique investments you could ever possibly make would be an authentic championship ring. There are some facts which you should be familiar with prior to even beginning to shop. Knowing these facts will help you more easily find what you're looking for. Let's begin with some basics. Remember, first that championship rings are awarded for many different professional and collegiate sports. By far the most popular are World Series or Super Bowl rings, but fans of a particular college team may also gravitate toward a unique conference title or bowl game ring. They’re primarily awarded to team members and coaching staffs but other team officials are also awarded championship rings. Exactly which officials do (and do not) receive these rings is something of a matter of debate Clearly, a ring previously owned and worn by an actual player is going to be worth more than one owned by a member of the team's staff. Granted, these rings are harder to come by, but they can still be gotten a hold of if you're willing to do your homework. 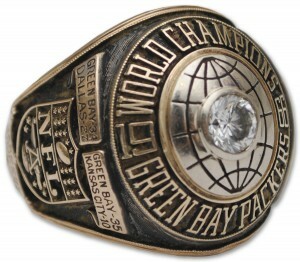 Of course, one of the most coveted of all championship rings is the Super Bowl ring. They are usually made of white or yellow gold, and embellished with diamonds. The NFL provides one hundred fifty of these rings to the winning team every year, at a cost of about five thousand dollars each. Generally, if a player is still alive, the ring is still in their possession. It is really their only official memento, on a personal level, of their championship. Authentic championship rings can sell for tens of thousands of dollars. Like most collectibles, much depends on the condition and whether the original diamonds or gems are still present. Who the ring belonged to is important as well. Collectors love history and having a player’s ring is all some will settle for. There are no two authentic championship rings that are alike. Almost always personalized and designed differently than that awarded to another team, they are created to reflect not just the title, but how it was won.